Class starts at 9am Wednesday June 26th, 2019 and concludes Sunday afternoon June 30th. 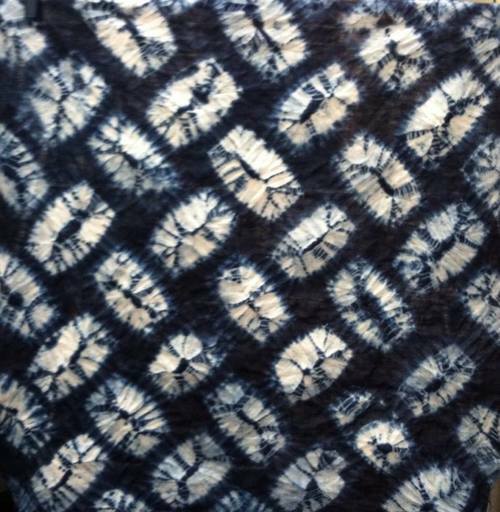 Shibori is a Japanese word used to describe the ways to create patterns on cloth by manipulating it before dyeing. Shibori comes from the verb root shiboru, “to wring, squeeze, press.”. Shibori techniques include stitching, folding and clamping, wrapping, scrunching, etc. Traditionally it is worked with Indigo as the dye. This workshop is an introduction to the Japanese art of Shibori and the stitching, folding and clamping techniques used to create unique patterns. The Japanese have used stitching to resist dye in shibori for many years. This technique is used to create designs of many types. it is the combination of the stitch used and the arrangement of the fabric that make the patterns. The principal stitch used in Shibori is the running stitch or Ori-Nui. Some refer to stitched Shibori as drawing with thread. You will learn many different stitch patterns including: Mokume (wood grain); Ori-nui (running stitch);Maki-Nui (oversewn stitch);Maki-age (stitched and tied); Karamatsu (japanese Larch/ radiating circle) & Komasu, and produce samples for future work. We will learn how to lay patterns out and then how to execute them. Itajime shibori is a shaped-resist technique. Traditionally, the cloth is sandwiched between two pieces of wood, which are held in place with string. More modern textile artists can be found using shapes cut from acrylic or plexiglass and holding the shapes with C-clamps. The shapes prevent the dye from penetrating the fabric they cover. By the end of the workshop you will have learned several different clamped patterns. You will come away with new friends, great memories and a collection of indigo dyed fabrics in various solid shades, and patterns!